Messaging runs in our blood since the internet and phone services made sending short messages easy! Today, the millennial generation checks their phone more than 150 times a day, and most times it is for messaging apps. But also among all Americans under the age of 50 texting is the most prevalent form of communication. And messages have a nearly 100 percent opening rate. Nevertheless, many businesses haven’t even thought about using this way of communicating with their customers yet: Not even half of the businesses are equipped with tools for this purpose. That’s remarkable especially because nine out of ten customers actually want to message businesses. Live website chats showed a significant growth in usage on business webpages recently. It helps businesses to provide exactly the information a customer is looking for when it’s needed. It’s an efficient and comfortable way for both companies and customers to share information instantly, meaning right now. The user can ask for support at any point of his visit on the webpage, and the company can even actively jump in when a user seems to get stuck somewhere in the website process. That’s great! But there are also limits of live website chat. First, it’s bound to the webpage. People have to get to the company’s webpage to be able to start a chat with the company. This can be an additional step reducing conversion rates significantly. Imagine you’re sending out an email campaign and want to provide your readers with a direct channel to ask for additional information. They would need to click and open your webpage and then wait for the website chat to open or click again to actively open it. As we know, every such click is a big conversation downer. After all, when they read your email, would they really realize that there is a direct channel waiting for them on the webpage? Second, a website chat is and has to be live and instantly, since users will get lost when they close the page. Even if they open another tab there’s a good chance that they forget about it and won’t be reachable anymore. Users expect a response immediately from a company like if they were in a phone call, otherwise they’re gone. But many companies don’t have the staff to answer their customers right away and around the clock. That’s why users might get frustrated. It can get even worse if they get put on hold like it happens with phone support a lot, just with a “we’ll be with you in a minute”-message instead of an annoying melody. So for the company it’s a now or never opportunity to catch up with new leads. 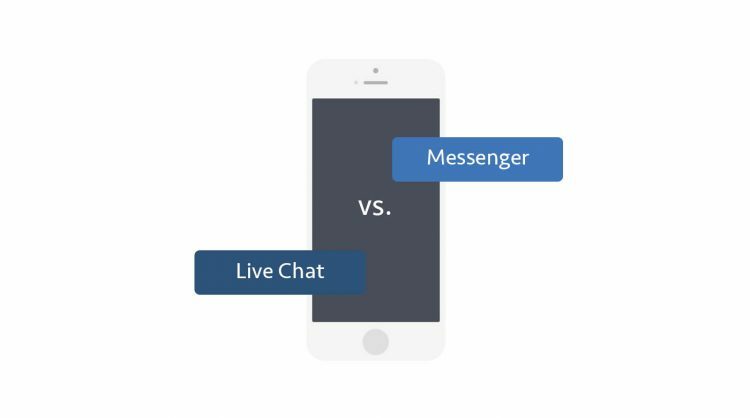 Messaging leverages live chat with features addressing these challenges. It creates lasting conversations which can be served asynchronously. Each party can respond when it fits best and the other side gets notified right away without the need to stay on the webpage. For companies this approach is much more efficient since they don’t have the pressure to answer within 30 seconds. There’s no need to stay online all day. It also gives them time to deliver good answers rather than letting customers wait while they need to collect necessary information. For customers, messaging adopts already well known technology and behavior from their private conversations to their communications with businesses. They can message businesses like they do with their friends. They just send out a message when they have time, get notified about responses and read and answer them when they find some time again. They don’t need to reserve time to communicate with a business but they can do it just on the fly, just when they have to wait those 2 minutes for the bus to come. Messaging is not bound to a company’s webpage, it lets people message a business right away from within the messaging app. Without visiting the company’s webpage. But how can even a new user connect to a company to start messaging? With thismo messenger we aim to let everyone start messaging with any business by just one click. Businesses get their individual messaging link which they can share like any other link in email campaigns, social media or even on print media. People clicking this link get directed into a browser based version of the messenger to start messaging immediately without downloading an app. No matter if they already use the thismo messenger. So with thismo messenger really everyone can start messaging you with just one click. Besides these flexibilities there are more advantages compared to live chat. It uses a technology we all already adopted. The back and forth model is easy to use by everybody. The conversation can continue after hours, exactly where it stopped, and you’ll always have the full history of the conversation in one thread. That gives context and continuity to your dialogue. It also enables you to add pictures and other types of media, which makes attaching media to e-mails needless. And messaging is informal: Nothing distracts from the message, there’s no subject line or signature. And since you don’t need a support team to stay online all day, messaging is less expensive than live chat. So wouldn’t messaging be a much more enjoyable conversation between a business and their customers? We at thismo messenger are convinced that easy to start messaging will be the future of customer communications and conversational commerce. And so we cut the limitations and let everyone start messaging every business with just one click!